Looks can be deceiving: Despite their reputation for being messy, hand towels are more hygienic than dryers because they physically remove germs. Bio-medical scientist Cunrui Huang says this is because wet hands are better at passing on germs than dry ones. Huang's review of 12 studies found that, overall, paper towels were ‘superior’. One study found they leave hands 96 per cent dry after just ten seconds. After 15 seconds, the hands are 99 per cent dry. By contrast, a drier takes at least 45 seconds. The amount of time is important because most people spend only a few seconds on drying their hands. One study found men spend 17 seconds using hot-air driers and women 13.3 seconds – a fraction of the time needed. Paper towels also scored higher because the rubbing motion may physically remove germs. By contrast, air driers may blow them on to the body – a concern in public toilets, where regular flushing of cisterns disperses germs in the air. 'This can increase the number of germs by an astonishing 255 per cent,' said Keith Redway, senior academic in Microbiology and Molecular Biology at Westminster University. Bacteria are then blown on to the hands of users and into the atmosphere. 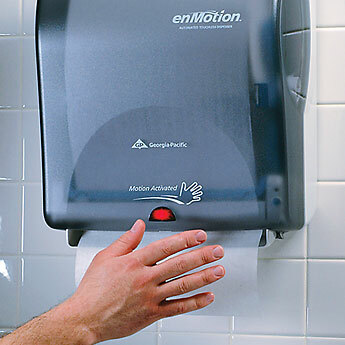 This leads to the potential for the spread of organisms such as salmonella and E. coli, as people often dry their hands before cleaning them properly. In the Mayo Clinic Proceedings journal, Dr Huang, of the Queensland University of Technology in Australia, said: ‘There is a risk of persons standing at air driers acquiring the bacteria dispersed in the air current towards them.